Synopsis definition and explanation are the basic things a learner should know in order to write a successful paper. Before get down to writing, make sure you understand the basic concepts and requirements to this type of assignment. As soon as teachers ask their students to prepare a synopsis on some topic, many learners are puzzled with a question “What is a synopsis?” Experts define synopsis as a summary of the main ideas of some composition. It is an overview of the plot and defining elements of a literary work, such as genre, characterization, setting, style, etc. Synopses are written for any type and genre of books and academic publications, including journal articles, as well as for movies, plays, video games, and TV shows to name a few. Along with the definition of synopsis, a learner should know the amount of detail such papers have to provide. Typically, this depends on the purpose of a synopsis. For example, when offering a literary work to publishers, an author has to create a lengthy synopsis that would provide an in-depth overview of the plot (including the resolution), character development, comprehensive explanation of the storyline as well as any other meaningful details. In this guide, we will concentrate on short synopses, like those found on websites and journals. 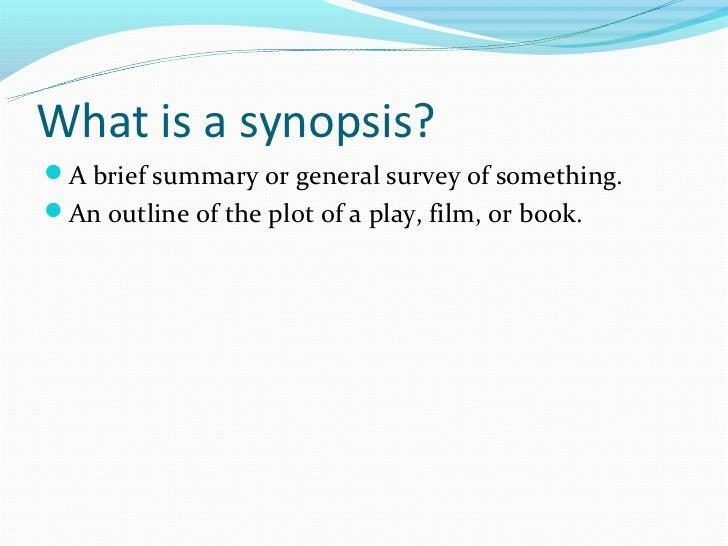 As a student, you will frequently be asked to prepare a book or movie synopsis, so you might be asking yourself (or Google) “What does synopsis mean?” In short, it is a brief description of the central theme and the main ideas of a piece. A movie synopsis or a book synopsis describes the main characters and highlights major conflicts. However, you do not have to discuss any subplots – those are to be mentioned only if they affect the main plot. As a professional writer, you will be preparing book synopses for editors and potential publishers. Although editors and agents will definitely read a few chapters of the book, they will also request a synopsis to understand the complete work. The skills of writing synopses will also be useful if you become a researcher or simply if you have to conduct a research for college. You have probably seen synopses of research articles in academic journals. Such synopses (abstracts) are very helpful when you are working on a literature review for your own research paper. A synopsis highlights the main aspects of the article, its arguments, methodology, and conclusion. Therefore, a synopsis helps you decide whether a certain article is relevant to your research and if it is worth reading in the first place. Another occasion that requires you to present a synopsis is a conference. Before presenting their topic to the audience, researchers have to submit a synopsis of their work. Later, it will be delivered to the conference delegates so that they could decide whose presentation to attend. Finally, as an undergraduate student, you will be requested to prepare a synopsis of your report or a long paper. In this case, like in a film synopsis, you will have to include a short description of your main arguments and conclusions. If you are submitting a detailed book review, include a plot synopsis. The same applies to a novel synopsis. It should be no longer than two paragraphs and it appears before the introduction of your paper. Synopsis vs Summary: Which Is Better? Synopsis vs summary is a competition with no winners because these two paper types are very similar and can be used interchangeably. The main difference between a synopsis and a summary is that the latter is usually very brief, around one page, while the former can reach up to 30 pages. Both paper types summarize the main ideas of the works and retain the author’s viewpoint. Avoid redundancies and superfluous information. It might be quite a challenge to fit the whole novel into a synopsis, so many authors prefer delegating this task to custom writing services. A synopsis of a novel is a concise description of what it is about. An effective synopsis will provide the reader with just enough details to grasp their attention and persuade them to read the novel. It is a short summary of a scholarly publication. Similar to synopsis, an abstract gives the readers an understanding of a work. However, synopsis and abstract differ by area of application: the term ‘synopsis’ is used in creative wiring to denote a summary of a book, story, film, etc., while ‘abstract’ refers to a summary of an academic paper. It is a short plan of what is going to be discussed in a written piece. Unlike synopsis, an outline is created during the pre-writing stage and is likely to undergo changes as the work progresses. In short, an outline is a roadmap of the future piece and it is prepared in the brainstorming phase. To conclude, synopses are written for the benefit of the intended audience. A synopsis performs two functions: summarizes the most important ideas of the bigger work and attracts the readers’ attention so that they want to continue reading. Besides, a synopsis allows the readers to select the works that might be beneficial for their professional activity.